The RSI 1720 HVLP bottom feed gun and cup in an economical choice to use with your HVLP system. 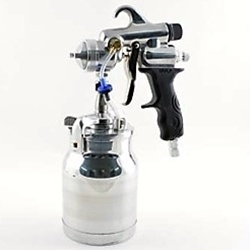 1720 spray gun is a versatile non-bleed, bottom spray gun. The 1720 comes with an all metal 1 quart cup assembly with stainless pickup tube and aluminum cup. The 1720 spray gun has a fan pattern control located at the top of the spray head. Turning the knob will change the fan pattern from round, to flat. The air cap rotates in the front of the spray gun to adjust the flat pattern from vertical to horizontal. The 1720 spray gun is also compatible with Fuji Mini cup assembly. Delivers a quality spray pattern.